I have to add before we begin, I am also hoping to see sightings of Simone's hottie boyfriend, former Michigan gymnast, Stacey Ervin. They are the gymnastics power couple of the century. Shots from the arena pre competition are floating on Twitter. Here is Simone and her teammate in her Catching Fire leo. Warm ups underway now, looks like Simone is starting on floor with Jade Carey. 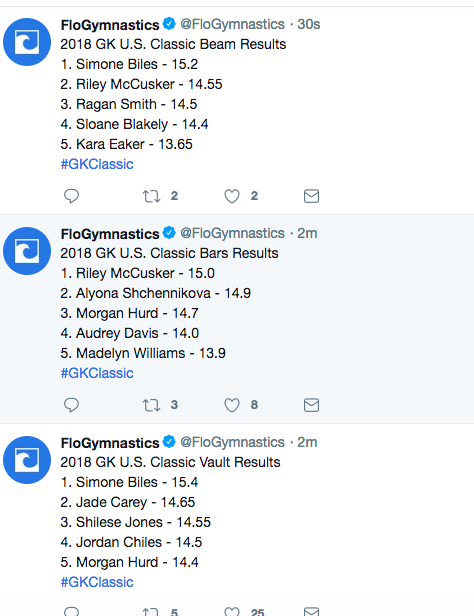 Ragan Smith is on bars, Morgan Hurd is on beam. 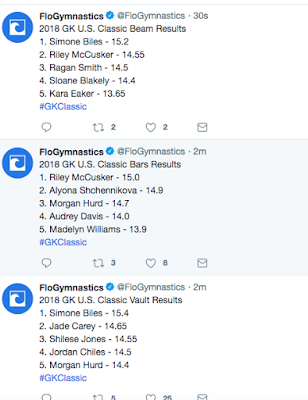 Riley McCusker and Alyona Shchennikova are starting on vault. Madelyn Williams FX - dbl arabian smal step foward, sw ring + tour jete 1/2, 1 1/2 + front full, almost steps out but stays in, wolf turn 2/1, nice flexibility, dbl pike, chest a bit down on landing, I guess she went OOB. NBC/ The Olympic Channel with obligatory footage of the new team coordinator, Tom Forester. Morgan Hurd BB - tuck full, solid, sdie aerial, sw BH S+ LOSO, solid, fro aerial + spl jump, + straddle jump, slides off on front tuck, her foot just came off it looks to me, sw ring round off + dbl pike, small hop. Kara Eaker FX - Triple full, beautiful, tour jete 1/2, dbl pike, low landing and puts her hands down. Nastia is fan-girling over Simone on the Olympic Channel. Emma Malabuyo BB - side split mount, wolf turn 2/1, BHS + LOSO + LOSO, slips on a front tuck straddle jump + Korbut flip, arabian, chest down, seems to be doubting herself after that fall, front aerial + spl ring jump, round off + dbl pike dismount. Chiles UB - toe full + shap + bail, toe shoot ot HB< giant 1/2 + pike jaeger, falls, in bar gienger, solid landing on dismount. Somehow the discussion with Forrester about Simone turned into a discussion of LeBron James. Ok.
Shchennikova - wolf turn 3/1 + 2/1 wolf, BHS + LOSO + LOSO, fro aerial small balance check, spl jump, onodi, small balance check, side aerial, sw leap, side somi, lovely so far, bhs + bhs + dbl back, chest a bit down, solid routine. Shots of her with her parents. She looks like her mom and Polina looks like their dad with Mom's blond hair. Olivia Hollingsworth UB - full in dismount, small step back. Luisa Blanco VT - DTY, small step on landing. 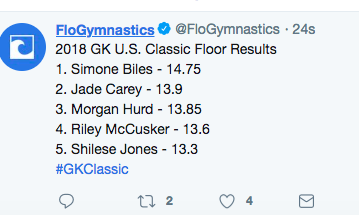 McCusker is beating Simone! That's an interesting development. Malabuyo VT - DTY, small step back on landing. Smith VT - DTY, chest a bit down, step to the side. Eaker BB - sw spl mt + spl ring mount, memmel tunr 1/1, front aerial + ring jump + bhs, side aerial + BHS + LOSO + LOSO, side somi, lovely, sw ring + BHS, sw 1/2 + korbut flip, sw leap, slides off the beam, miss her foot, sw + sw side, bhs + bhs 2 1/2, solid other than the fall. HAHA, Chris Burdette is texting on the sidelines. Carey BB - front roll Mount, wolf turn 2/1, leans back a bit, spl + side aerial, solid, spl 3/4, BHS + LOSO + lay 2 ft sligth wobble, sw + sw 1/2, + back tuck, frotn aerial, wobble, straddle jump, pulls a Chiles on her round off -dbl pike dismount, over rotates and takes several steps back. Grace McCallum BB - candlestick mount, wolf turn, 3/1, + 2/1 wolf, straddle 3/4, side aerial + LOSO, fro tuck, sw + fron aerial, foot slides off, full turn, round off + dbl back. 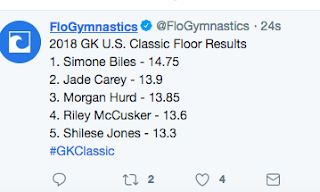 So Simone just casually won 3 of 4 event titles plus the AA, NBD!